The first time I can remember being enough of a gardener to notice a distinctly different – looking shrub in a garden setting, it turned out to be Cotinus coggygria ‘Royal Purple.’ Here this thing sat amidst perennials in a friend’s garden, four feet tall, with small, oval, PURPLE leaves possessed of a dull, leathery sheen. Young growth at the tips was shinier and more of a blood red-yowzer. Years later I still find it one of the most arresting shrubs available to northern gardeners today. There are many varieties of Smokebush with which to play. ‘Royal Purple’ is common in the trade and in my mind it’s the most striking of the genus. The wispy clumps of tiny, smoke-like flowers are a purplish-pink. ‘Velvet Cloak’ is virtually identical to ‘RP’, ‘Nordine’ has more reddish leaves and pink flowers, and ‘Daydream’ has green leaves with tan, very smoke-like flowers. Smokebush is not super-hardy (-20° F/-29° C), though it is correctly sold as a Zone 4 plant. Some dieback is common as the result of colder winters, but it grows back quickly in the spring, and should discourage none from growing this marvelous plant. 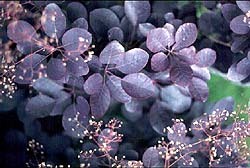 Smokebush needs full sun; good light is essential for rich foliage coloration. The same old rules of soil apply: well-drained soil with ample organic matter. Avoid spots that remain damp. Left alone in the right spot in warmer climes, Smokebushes will grow 10′ high and equally as wide. Winter dieback keeps them considerably smaller than that, plus you can prune as harshly as you choose to control height and width. The plant flowers on new growth. Some people cut the shrub all the way to the ground in early spring, because foliage on new growth will have richer color. What I’m trying to say is it’s easy to grow the shrub anywhere between 2′ to 4′ tall, and however wide or narrow you choose. Fertilize in spring with 10-10-10 if your soil needs help. Put down a 2″ layer of mulch after ground warms in the spring. Don’t let the soil dry out around the plant during the growing season, particularly during the heat of the summer. This is a shrub you want to remember to water once a week. Stop watering in mid-September to help the plant into winter dormancy. If late fall is very dry and temperatures remain above freezing, give the ground a good soak after the plant has gone dormant. This is called gardening. Plant smokebush in your perennial gardens. Good perennials to bounce off the front of it are Alchemilla mollis (Lady’s Mantle), taller Stachys. Irises, and Artemisias. Surround it with large- or long-leaved perennials such as Digitalis, Lilies, Monarda, or something airy like Perovskia (Russian Sage). In a mixed-shrub planting, the authors of Growing Shrubs and Small Trees in Cold Climates (look for this book in an upcoming Top Pick) suggest Buring Bush, hydrangeas (I wouldn’t, but I see what they mean), and Mock Orange for starters. To this list I would add evergreens such as junipers, arborvitae, and Mugho pine.